On a recent family excursion to Multnomah Falls, a place I’ve been too few times, I noticed a sign along the trail that I hadn’t read before, probably because I assumed it had something to do with rock formations and/or water volume as most of the signs do. But this one was different. It described an event from September of 1995 when a boulder weighing 400 tons (according to the sign that is approximately the same weight as a school bus filled with concrete, and go ahead and disprove that) fell from the rock face next to upper Multnomah Falls, plunging 225 feet into the pool at the bottom. Upon entering the water the school bus boulder produced a 70-foot splash that washed over the observation bridge, completely dousing a wedding party that had been posing for pictures. 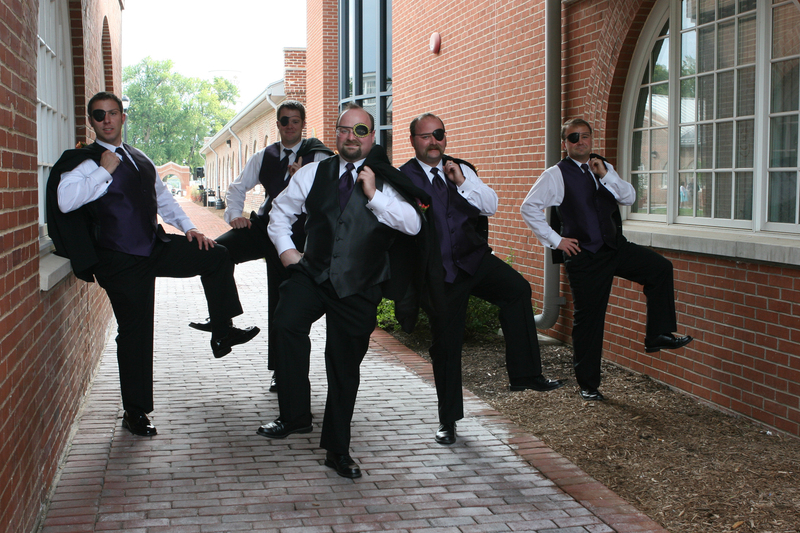 Now, I may not care much about geology, but I am a big fan of wedding photos. In case you haven’t been to the falls, though, let me just provide a little background. Located on Interstate 84, just outside of Portland, Multnomah Falls drops a total of 620 feet, making it the highest waterfall in the Columbia River Gorge and the second highest year-round waterfall in the United States. Between the upper and lower portion of the falls spans Benson Bridge, constructed in 1914. And if geology is your thing, Multnomah Falls is allegedly a fascinating place to visit because rumor has it you can see something like six different lava flows, evidence of flooding that occurred thousands of years ago, and probably even some really interesting differences in rates of erosion that have led to the tiered formation of the falls and the occasional plunging school-bus-sized rock. Personally, I just care that it’s pretty. 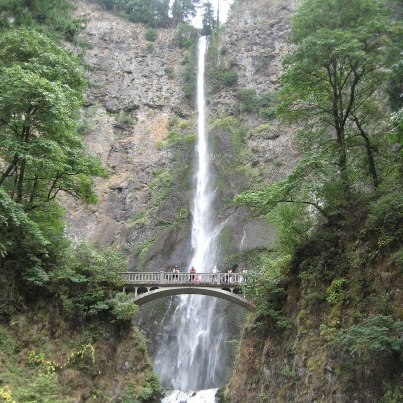 In fact, all those impressive geological goings-on coupled with the well-placed bridge in the middle make the easily accessible Multnomah Falls an ideal spot for all your magical wedding photo needs. Then there’s the tragic and super romantic mythological accompaniment that I didn’t even mention yet. According to one Native American legend, the chief of the Multnomah people had a beautiful and beloved daughter. He arranged for her to marry a strong young chief from the neighboring Clatsop people and planned many days of feasting and celebration during which tragedy struck. A terrible sickness descended on the wedding festivities. The only solution, as determined by an honored medicine man, was for an innocent maiden to sacrifice herself. The idea was that her sacrificial love would impress the Great Spirit and the sick would recover. When her betrothed fell ill, the young maiden took it upon herself to save her people. She climbed up to the high cliff and leapt to her death. As a token of her loving sacrifice, a spring welled up on the cliff top, the water descending as a lasting bridal gown testimony to the young maiden. I don’t know about you, but had I gotten married in Oregon, I think we would have made the effort to get that picture. But even though the myth lends a certain wild sentimentality to the photo op, I have to wonder if it ultimately makes a lot of sense to get fancied up in tuxedoes and ball gowns and go for a hike. Assuming here that your daily wear is somewhat less formal, don’t the memories painted by such pictures just ring a little false? Yet as anyone who has ever tried to make small talk with relative strangers for hours at a wedding reception while waiting for the bridal party to arrive knows, couples do this kind of thing all the time. In fact, my husband was a groomsman at the beginning of this summer and while I’ve not yet seen the photographic evidence, it sounds like things may have gotten a little out of hand. Let’s just say there are some modern art sculptures on an undisclosed Midwestern college campus that are probably feeling a little violated. What that has to do with the celebration of marriage, well, you’d have to ask the couple. No one else seems willing to talk about it. So the sign at the falls got me thinking about wedding photos and it happens that a few days ago some good friends of mine celebrated their wedding anniversary. It’s one of those that I always remember not only because I was a bridesmaid (and I actually liked the dress, and yes, I have even worn it since), but also because they had the foresight to get married on International Talk like a Pirate Day. They’re a great couple and I am honored to be featured in their wedding photos, in which I never once posed with any modern art sculptures. But as I was looking back through the pictures, I realized that along with the lined up bridal party, the first kiss as husband and wife, and the gathered family, were some of the other kinds of photos as well: the ones in which excessively well-dressed people are deliberately posed in unnaturally casual ways. Clearly these men are pirates. You can tell by the way they are standing. I am happy to report, too, that the Multnomah Falls wedding deluge resulted in no major injuries. In an interview after the wedding, the bride said of the event, “We got the tragedy out of the way and now we’re home free.” That’s a great attitude that I assume has led to many years of happily ever after. I just hope someone managed to snap a picture of the splash. 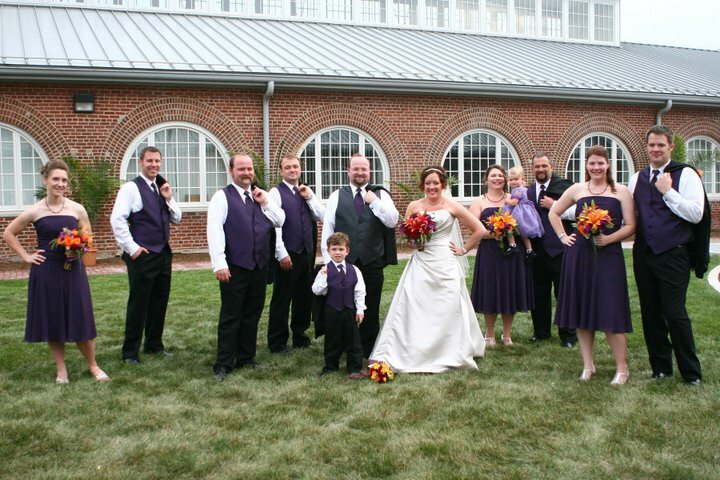 Just a bunch of well-dressed people casually hanging out in a courtyard, cuz that’s how we roll. These wedding pictures are used by permission and may not appear elswhere without consent, lest ye be wantin to walk the plank.